BUILDING at 429 N. Larchmont Blvd. 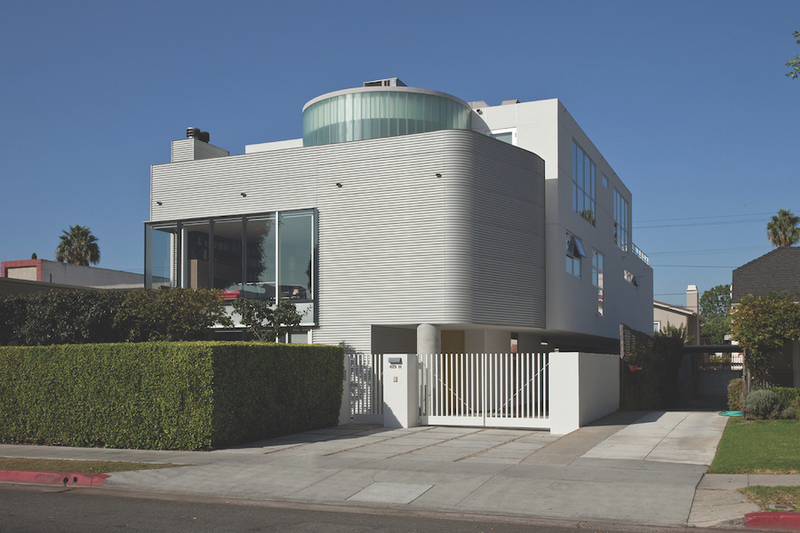 was designed by Scott Johnson, FAIA, of Johnson Fain, for his family. The Jane Club, an enterprise launched last year by producer and actress Jess Zaino and actress June Diane Raphael, moved to 429 N. Larchmont Blvd. last month. The mixed-use building, designed and built in 2000 by architect Scott Johnson, FAIA, of Johnson Fain for his family, has a high design element that the club is looking forward to taking advantage of, says Dori Howard, one of the co-CEOs at the Jane Club. The light and bright rooms and the outdoor spaces will be put to good use as office spaces, co-working spaces and community rooms, she added. There are five outdoor spaces, including a play area for children. The pool will be covered, and that area will become a co-working area, while a balcony will be a designated quiet area. One of the other outdoor areas will be a community space for special events, such as speakers giving advice on finance and business, group meetings, political functions, and fun activities, such as a recent chocolate tasting. ORIGINAL living room of the Johnson residence features bright, open spaces. Howard noted that the reason Larchmont became home base for the Jane Club was the sense of community. In addition, many of the women the Jane Club would like to serve — career women with children who work from home — reside in this neighborhood. (In fact, many of their current members walk to the Jane Club from home.) The area also has a good cross section of women who want to excel in both career and home life, but might need a little help to do that, says Howard. BRIGHT light comes into the circular space on the third floor of the house. The co-working space caters to all working women, says Howard. “We want to take care of women who take care of others,” says Howard. She’s also quick to point out that the club is open to men, and that there are very few co-working spaces in Mid-Wilshire Los Angeles. What makes the Jane Club different from other co-working spaces, or from simply getting a nanny or daycare, is the centralization of services available, as well as the sense of community, says Howard. She further notes that many career women who are also mothers can feel isolated when working from home. And it becomes a challenge to have a freelance career while spending much of the working day driving from one errand to another. At the Nest, the childcare part of the Jane Club, children can play and participate in enrichment activities while their moms (or dads) are working nearby. Howard said, however, that at least 25 percent of the membership does not have children. Extra services also are available onsite, such as hair styling or car washing services (yes, there is parking onsite, plus reserved spots on a nearby lot). Healthcare personnel come in occasionally for breast and physical exams, as well. Howard says they hope to add other events and services in the future. Zaino and Raphael were inspired to open the Jane Club by Jane Addams, who has been called the “mother of social work.” She opened Hull House and other homes for working women in the Chicago area in the late 19th and early 20th centuries. In honor of Jane Addams’ work, a legacy fund was established at the club that members can contribute to for support of members who would not otherwise be able to join. The goal is to have 10 percent of the total membership be maintained by this fund, and so be able to provide a safe, calm space for a career woman who otherwise would not have access to such a space. “We believe that the Jane Club is a movement,” says Howard, when asked about whether she thought there might be satellite locations in the future. Membership prices begin at $250 per month. For more information, visit janeclub.com. Hull House was not a place for working women to live. The Jane Club was near to Hull House and was a place for working women to live and named for Jane Addams but it was separate from Hull House in its early years. Eventually it had a building on the Hull House campus but it was never operated by Hull House. Three cheers for the fund to welcome this California Jane Club’s working class members! !